Triumph Motorcycles India is all set to launch the Speed Twin motorcycle in the domestic market by next week. The company has officially started sending out invites to media for the launch event of the new motorcycle. 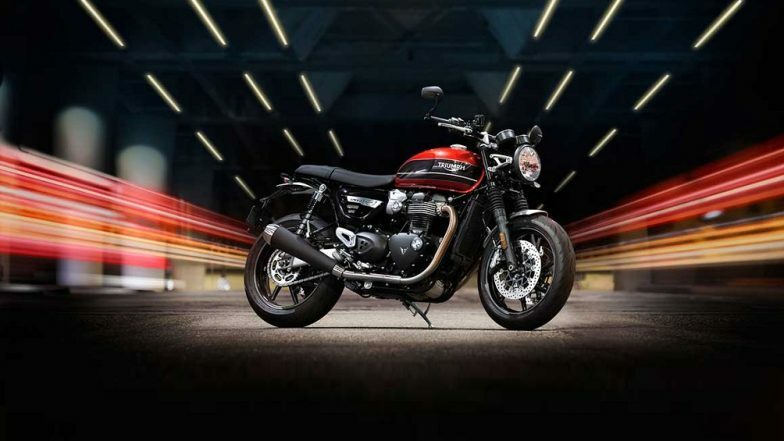 To be positioned in between Street Twin and Thruxton, the new Speed Twin reportedly will carry similar design as that of Street Twin, however, some cosmetic changes and bigger engine are likely to be seen on the upcoming machine from Triumph. Designed for long comfortable rides, the modern classic roadster will take on Ducati Scrambler 1100 and Kawasaki Z900. As far as the pricing is concerned, the new Speed Twin is likely to be priced somewhere around Rs 10 lakh (ex-showroom). On the mechanical front, the new Speed Twin is expected to be powered by a 1200cc, liquid-cooled, parallel twin motor that will be mated to a 6-speed gearbox. The motorcycle will be churning out 98 bhp of maximum power at 6750 rpm against peak torque of 112Nm at 4950 rpm. The company has also made some changes on the motor by replacing the cam covers with magnesium ones, which has resulted in weight reduction of 10kgs approximately. Moreover, the distinct exhaust sound of the bike is possible particularly because of 270-degree firing. The new Speed Twin motorcycle will be offered with three ride modes - Rain, Road and Sport. The company will also be adding heated grips and TPMS (Tyre Pressure Monitoring System) on the Speed Twin. For safety, dual-channel ABS with switchable traction control will be seen as standard on the motorcycle. The deceleration duties on the motorcycle will be carried out by twin 305mm Brembo disc brake upfront and single 220mm disc at the back. The suspension duties are carried out by 41mm cartridge front forks and twin shock absorbers with adjustable preload at the rear. The bike is expected to be seen in three exciting colour options - Korosi Red and Storm Grey, Silver Ice and Storm Grey and Jet Black.